When food service operators experience wide percentage swings between in season months and off season months, I recommend a simple analytic tool. The key to using the tool is a list of managers and staff working year round. Once you have this list, it is possible to calculate the monthly labor cost and the estimate of food consumed by these people. In theory, the costs associated with paying and feeding the core team should be the same each month. Sales may fluctuate widely. As an example, let's use three managers with a monthly salary and benefits expense of $16,000 and food consumption of $540. We'll use six staff employees with a monthly expense of $12,000 and food consumption of $720. Combining the 9 core people, we would pay $28,000 monthly and they would consume $1,260 in food. The table below shows the impact on percentage results as volume changes. While labor cost % spikes during downturns, the employee food consumption should not produce a huge swing. Using dramatic changes from $2,500,000 in sales to $250,000 would only account for a 0.45% change in food cost percentage. So why do food cost percentages go sky high in off season periods? I believe chronic waste and theft are exposed. However, we can imagine a 100% theft free kitchen and focus on waste. Waste will increase as volume drops if the menu choices do not change in the off season. Producing food for a varied menu with lots of choices in each meal period and menu category puts huge pressure on the forecast team. They need to accurately predict the covers and the expected menu profile. If they miss on the busy weekend, the garbage cans will be loaded with dollars of food cost. 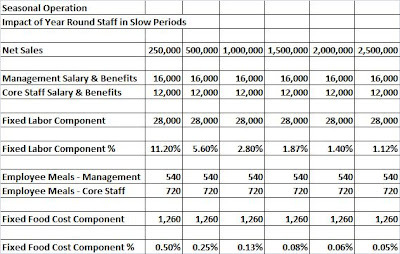 In summary, it's difficult to explain away huge upticks in your food cost percentage with employee meal expenses. Try to decrease the number of menu offerings when you are slow. Watch for repetitive waste issues (e.g. an entire prime rib is cooked and only two portions sold - the rest is used in sandwiches and soup). Slow periods do help daily theft issues to surface.